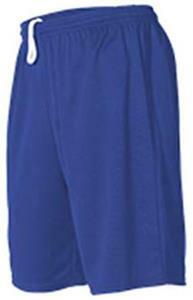 Alleson Adult Multi-Sport Shorts with Pockets are made of 90% eXtreme microknit cationic colorfast polyester and 10% spandex with moisture management fibers. It features a single ply body with two on-seam, self-material "deep" pockets that make it perfect for coaches. Other features include a 2" extra comfortable covered elastic waistband with inside drawcord and a 9" inseam. Top Selling Item. This short is made of 90% eXtreme microknit Cationic colorfast polyester/10 % spandex with moisture management fibers. It features a single ply body with two on-seam, self-material "deep" pockets that make it perfect for coaches. Other features include a 2" extra comfortable covered elastic waistband with inside drawcord and a 9" inseam. All Shorts Have Side Pockets with or without the option of one back pocket with button closure. WAIST 28" - 29" 30" - 32" 34" - 36" 38" - 40" 42" - 44" 46" - 48" 50" - 52"
Shorts fit great. Plenty of room to move around the pockets. Fairly deep.